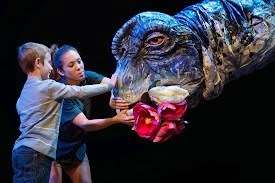 If folks can’t catch Erth’s DINOSAUR ZOO Live at Watertower, you have two more chances to catch the show at the ECC Arts Center April 1 at 7 p.m. and April 2 at 9:45 a.m. The ECC Arts Center located in Building H on the Elgin Community College Campus, 1700 Spartan Drive, Elgin. Tickets are $24 for adults and $15 for children age 12 and under. Parking is free. Click here for ChiIL Mama's prior Dinosaur Zoo coverage including show video & photos. Get four tickets to this interactive dinosaur experience for $60 ($15 per ticket)! 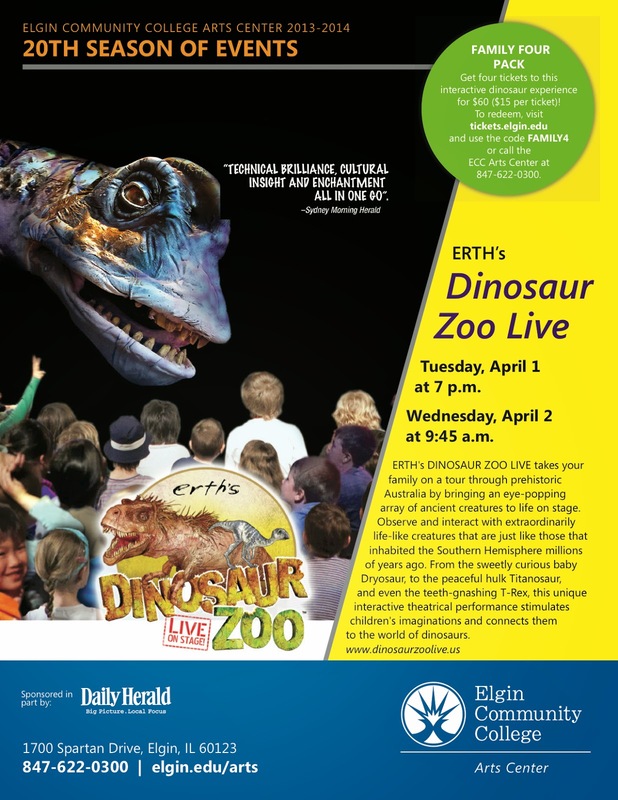 To redeem, visit tickets.elgin.edu and use the code FAMILY4 or call the ECC Arts Center at 847-622-0300. Tuesday, April 1 at 7 p.m.
Wednesday, April 2 at 9:45 a.m.
Tickets may be purchased by phone by calling 847-622-0300 (All major credit cards are accepted) or online at tickets.elgin.edu or at the ECC box office located in the Arts Center. Box office hours are noon to 7 p.m. Monday through Thursday, noon to 5 p.m. Friday and noon to 5 p.m. Saturday. NOTE: to accommodate the early performance on April 2, the box office will open at 8:15 a.m.
on April 1 & 2. Menu will include Prehistoric Punch, Pterodactyl Tenders, Brontosaurus Burgers, and a Swamp Sundae. All of these items will be on a special menu with coloring sheet. They'll be offering the menu from 4-10p.m. on Tuesday, April 1 and at request for lunch on Wednesday, April 2. It will be offered at both the McLean restaurant which is located at the corner of McLean Blvd. and Spartan Drive (600 S McLean Blvd, Elgin, IL 60123 ) right next to the main entrance of the college and at the St. Charles-West restaurant located on Randall Rd. (552 S Randall Rd., Saint Charles, IL 60174. For more info, visit the Colonial Café's website: http://www.colonialcafe.com/.